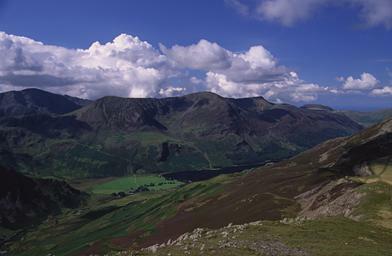 In the foreground on the left is Low Raven Crag, the spur of Fleetwith Pike and down in the valley lie Gatesgarth farm and Buttermere. On the horizon, from the left, are Pillar, Steeple, High Crag, High Stile, Red Pike Starling Dodd and Great Bourne. Larger version of this picture.